Welcome to Episode #5 of the Silent Noise Project. It’s snowing in here. How cheesy is that? [Update as of 20 January 2012: No, it isn’t snowing any more. It was cheesy. And it interfered.] This was originally going to be the “Quantum Mechanics and Red Leicester” episode, in honor of Monty Python’s cheese shop sketch. But since there are only six people in the United States who know what Red Leicester is (or how it’s pronounced), this was eventually voted down by the People’s Revolutionary Podcast Episode Naming Committee. This American Life is one of the best radio shows out there. You can find out more about it, including listening to the current episode and downloading previous episodes, by visiting their website at thisamericanlife.org. You can read all about Red Leicester here. Of course, the real thing is always here. If you want to find out what the big deal is, you can always read this and scare away all your friends. I didn’t hear Straight Outta Junior High until late this summer—and immediately became a fan. 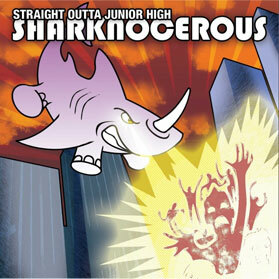 Sharknocerous is their latest album. Their website is here. (Warning: some of their songs are NAFS, NAFW, NSFS, or NSFW. Turns out they are from Omaha, Nebraska. The video I mentioned is below. Pay attention to the comments, if they are still there. BTW, Mr. Kobayashi was actually played by Pete Postlethwaite, an English actor, who died just this past January. But that’s kind of the point of the song, isn’t it? The part about being English, I mean, not the part about having died this year. Other posts about the Aluminum Incarceration are here. Here is a cool story about naming things (or unnaming them, actually) by Ursula K. LeGuin, called “She Unnames Them.” Wonderful story; questionable web design. This is possibly the most important, and therefore least coherent, part of this podcast. If you listen carefully around 21 minutes, you can hear a Gmail notification dinging. You can read more about the Patinettes (who are actually from Zaragoza, Spain) and hear more of their music here, or you can visit their website. Holy cow, I think I used the word “harking” in here. Welcome to the seventeenth century. Yes, I don’t like this title. You are perfectly free to suggest a new title in the comments down below. If you have a minute, go over to Spiraling’s website and listen to their song “The Future.” It’s not podcast-safe, but it’s still a song full of awesome, so you really should listen to it. That reminds me of a recent incident. Although I am usually pretty even-tempered, nice and friendly (except on Tuesdays), I had to lay the electronic internet smack-down on some snotty-faced heap of parrot droppings the other day. You can read about it here. Who uses myspace anymore? hahaha great job Mr. Odle! You should put these on iTunes! I’m working on the iTunes thing, but Apple makes this difficult.